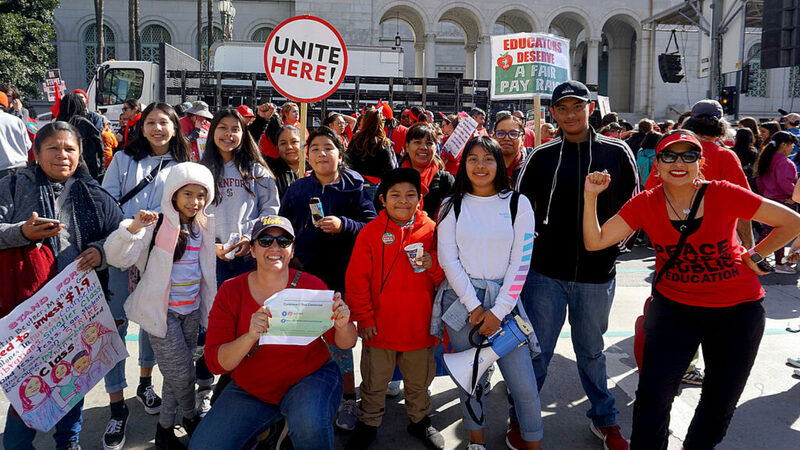 Adrian De La Cruz, an 11th-grade student at LAUSD/USC MAE Magnet School, epitomizes the movement growing out of East Los Angeles to support public education and stop privatization. Encircled by his father, mother, two sisters, and grandmother (visiting from Puebla, Mexico), Adrian says he was ready to support the strike since his teachers and mom told him it was a possibility back in 2017. With his mother and sisters, he was part of Reclaim Our Schools Los Angeles’s Leadership Action School. Adrian took part in the direct action and political education workshops of the Leadership School throughout the strike instead of attending classes at his high school. De La Cruz’s favorite action was when ROSLA occupied the lobby of Oaktree Capital, a private equity firm that gentrifies neighborhoods and supports the privatization of education. De la Cruz says he’s usually “rather closed off, but during the strike, I felt more outspoken.” By the end, he was leading chants and taking on leadership roles, such as security/peacekeeping during direct actions. As for his future, De La Cruz is considering two careers: civil engineer or mathematics teacher. After the strike, he sees “there is a lack of teachers. I was influenced to be teacher.” He says he wants to be an engineer because in his previous school, Brooklyn Avenue Elementary, part of Mathematics, Engineering, Science Achievement (MESA), he won competitions building simulations of bridges. He’d like to contribute to his community with building better structures. Adrian says he feels proud to represent East Los Angeles in the coalition.“I feel that we are recognized now,” De La Cruz says. “We have economic hardships and need more teachers.” He continues to support the movement, joining his mother in the Eastside Padres Against Privatization Group and ROSLA.